Aspöck, H. 1998. Distribution and biogeography of the order Raphidioptera: updated facts and a new hypothesis. Acta Zoologica Fennica 209:33-44. Aspöck, H., and J. Gepp [Ed.]. 1986. The Raphidioptera of the world: a review of present knowledge. Recent Research in neuropterology. Proceedings of the 2nd International Symposium on neuropterology in Hamburg, Federal Republic of Germany. Published by the editor, A-8502, Lannach 281, Austria. 1-176. Chapter pagination: 15-29. Aspöck, U., and H. Aspöck. 2004. 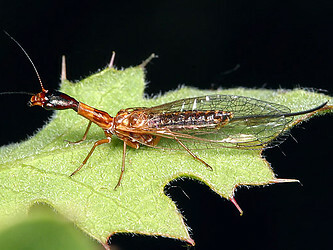 Two significant new snakeflies from Baltic amber, with discussion on autapomorphies of the order and its included taxa (Raphidioptera). Systematic Entomology 29(1):11-19. Dong, R., and H. Youchong. 1994. A cladistic study on the familial phylogeny of fossil and living Raphidioptera (Insecta). Bulletin of the Chinese Academy of Geological Sciences 29:103-117. Engel, M. S. 2002. The smallest snakefly (Raphidioptera: Mesoraphidiidae): A new species in Cretaceous amber from Myanmar, with a catalog of fossil snakeflies. American Museum Novitates 3363:1-22. Del Puerto Canyon, California, U.S.A. Page: Tree of Life Raphidioptera. Snakeflies. The TEXT of this page is licensed under the Creative Commons Attribution License - Version 3.0. Note that images and other media featured on this page are each governed by their own license, and they may or may not be available for reuse. Click on an image or a media link to access the media data window, which provides the relevant licensing information. For the general terms and conditions of ToL material reuse and redistribution, please see the Tree of Life Copyright Policies.